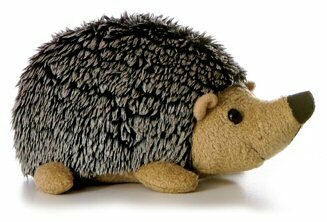 Howie, this adorable Mini Flopsies stuffed hedgehog, is a fun addition to any household. With fun, spiky fur, soft tan accents, and a sweet face, Howie the Mini Flopsies stuffed hedgehog is ready for hours of imaginative fun and adventure. This is a perfectly well crafted stuffed animal. Picture doesn't do it justice. I would highly recommend this to anyone wanting to buy it. It is adorable. Size, color is exact to what is written in description. Very reasonably priced!!! !